Tagged under Bishoujo Senshi Sailor Moon, Codename: Sailor V, Blue Eyes, Long Hair, Blonde Hair, Waifu, Hair Bows. 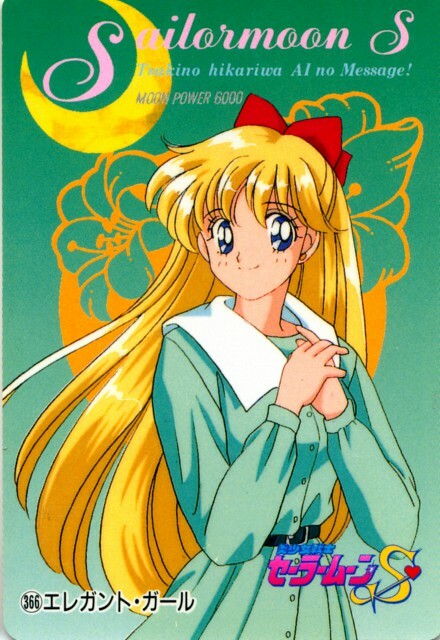 Before the events of Bishoujo Senshi Sailor Moon, Minako fights crime under the identity of Sailor V. During Codename: Sailor V, she is shown to be obsessed with boys, quickly moving from one crush to the next (sometimes in the span of one day). Like Usagi Tsukino, her grades are horrible (as she is too tired to study after volleyball practice), she enjoys spending time at the local arcade, and initially skirts around her duties as a Senshi - prompting several arguments with her companion cat, Artemis. In the manga, however, she is much more responsible and serves as the leader of the Inner Senshi. Minako is the first of the Inner Senshi to regain her memories of the Silver Millennium.